This webinar was hosted by Gerry Jeffcott from 3Sixty Public Affairs. 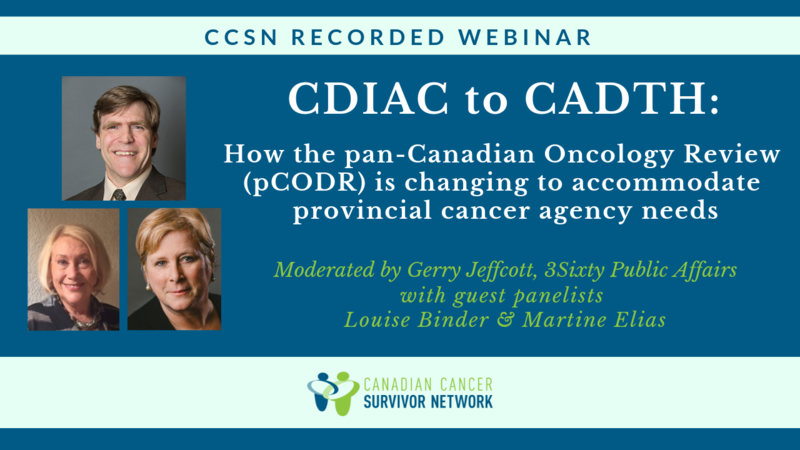 He summarized some important changes that the Canadian Agency for Drugs and Technologies in Health (CADTH) has proposed to the way pCODR reviews new cancer medications and outline the current consultation process. Following the CADTH summary, patient representatives Louise Binder (Save Your Skin Foundation) and Martine Elias (Myeloma Canada) offered their perspective on the proposals and helped frame the patient feedback.